Today, June 12, is election day in Maine. 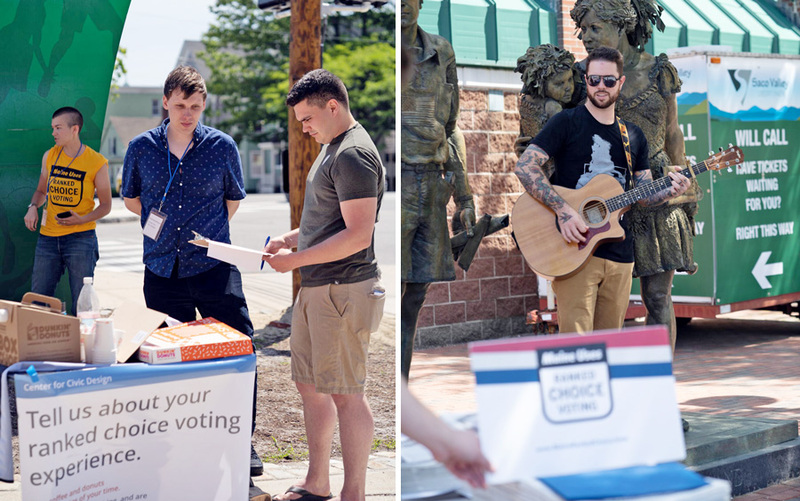 Polls just opened up this morning at various times throughout the state, and grassroots volunteers are speaking with voters, explaining Ranked Choice voting, and supporting the voices of Mainers. Represent.Us National Field Director Rob Booth and Deputy Political Director James Jameson—both proud Mainers— have joined efforts on the ground today to get out the vote. Be sure to check our social media to follow the GOTV efforts for Yes on 1 in Maine today. You should really see this: https://act.represent.us/sign/election-day-maine-rcv?source=taf . RepresentUs has a smart plan to fix our broken political system. Check it out. At 12:05am, Decision Desk HQ calls the vote in favor of "Yes" - Mainers overwhelmingly supported Yes on Question 1 to protect Ranked Choice Voting! A little after 11pm, RCV supporters were huddling over computers tabulating votes and checking sources from local and national outlets. Yes on 1 holding a steady 10 point lead with 54% of the votes in. “Waiting for a media outlet to call it,” the campaign says. At 11:37pm, the New York Times had 55% of the vote tallied, with 54.8% for the yeses. If this holds, RCV could win by a greater margin than their first win at the ballot in 2016. The polls have closed and counting begins. The People's Veto inspired a huge statewide campaign. The fate of RCV depends on voters coming out to cast their ballots during a primary election, a time when most voters stay away from the polls. 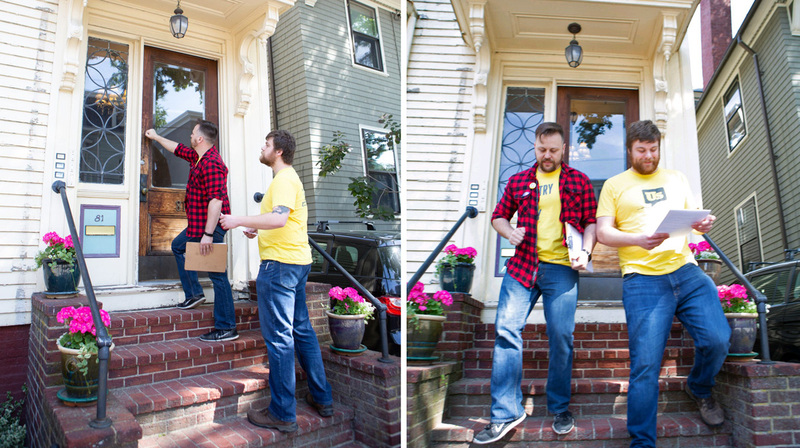 Volunteers crisscrossed the state today, speaking with voters, knocking on doors and spreading the word. Only 2 hours left to head to the polls! 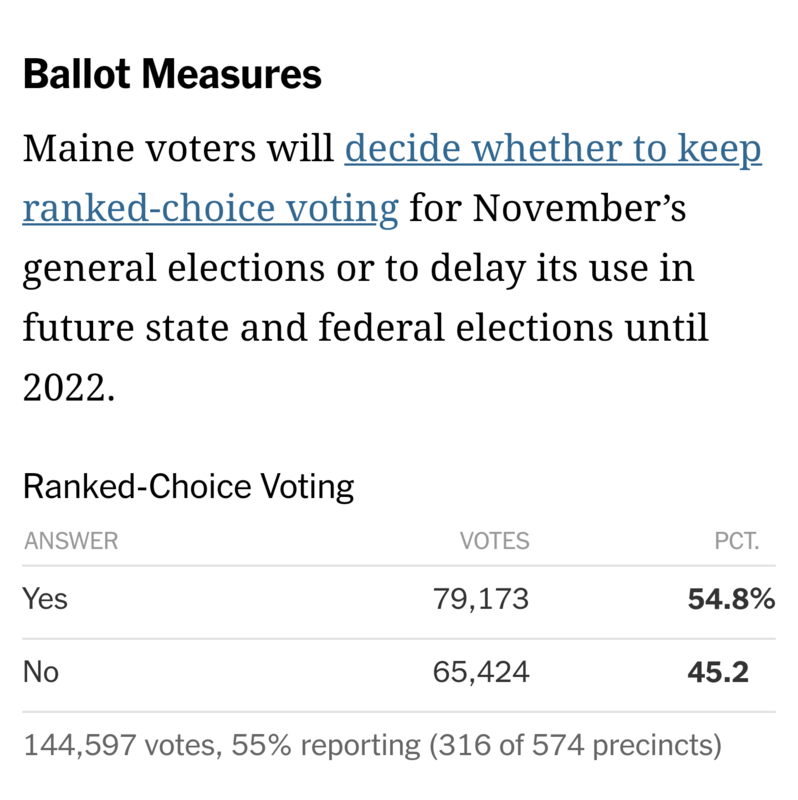 Mainers have the choice to vote to protect Ranked Choice Voting, make your voices heard! Represent.Us Founder and Director Josh Silver hitting the doors to speak with voters, and making his field director proud. A great leader does not tell you what to do—they show you how it's done! 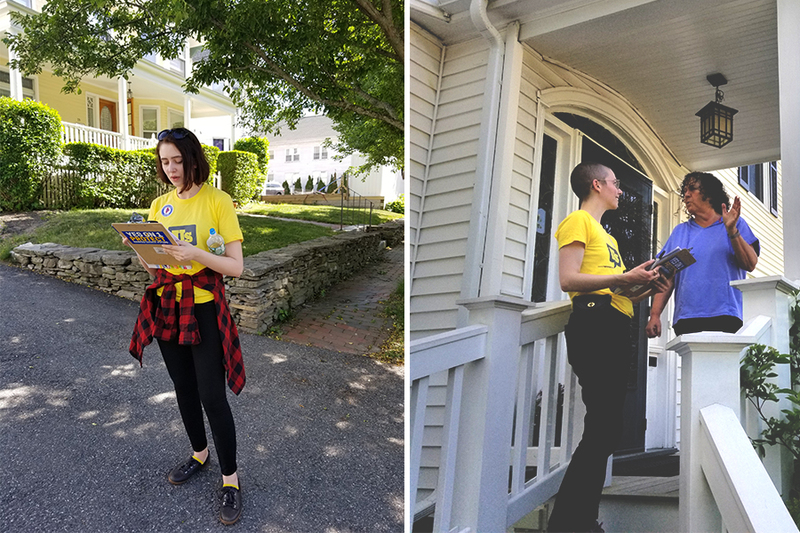 Staff and volunteers engage with residents across Maine. Our volunteers headed to the RCV Maine Headquarters to support the GOTV efforts. 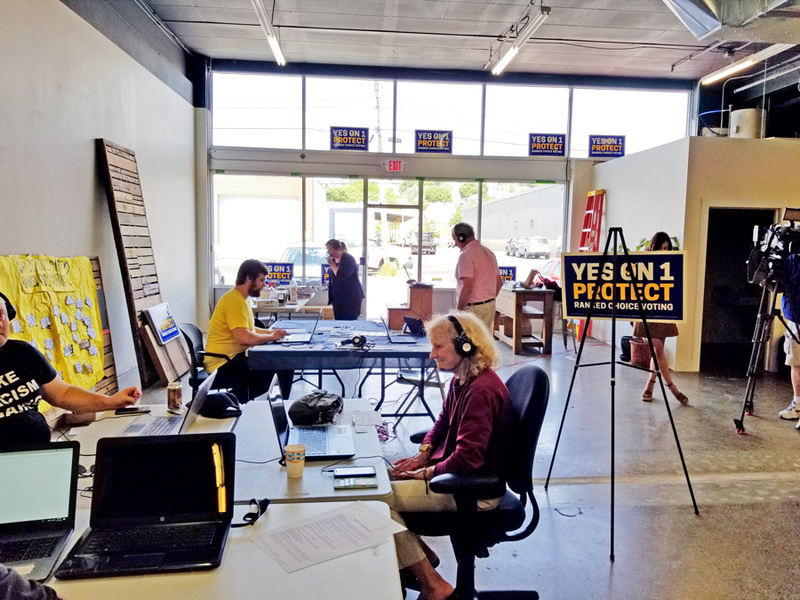 Mainers are hard at work throughout election day, calling voters and reminding them of the primary, and giving more information about what Ranked Choice Voting is-and what it means for Maine. 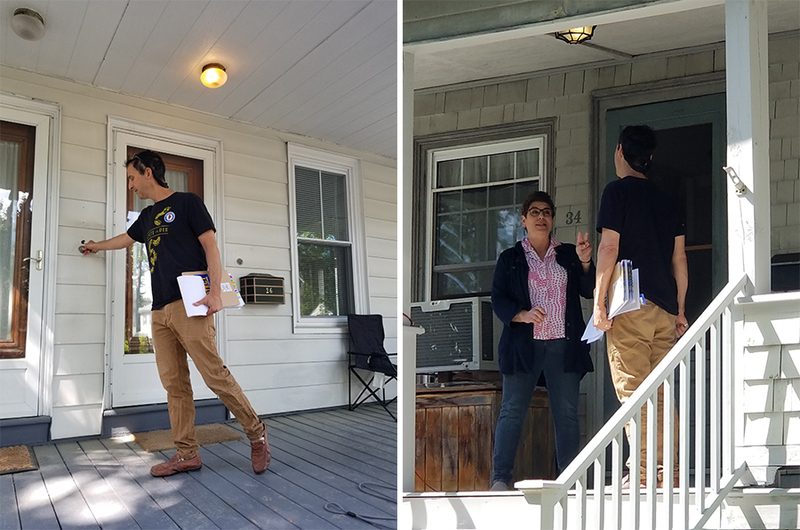 Volunteers are all across the state today, speaking with voters, knocking on doors, and getting out the word to vote Yes on Question 1 to protect Ranked Choice Voting. 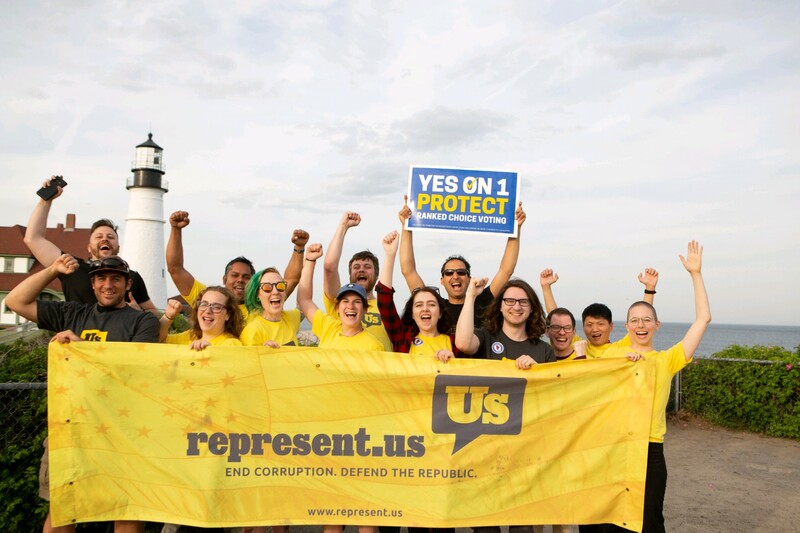 Voting Yes on 1 in Maine is a vote for simple and fair elections that gives voters more choices. Check out this video to learn more about what RCV is and how it can change our future elections for the better. 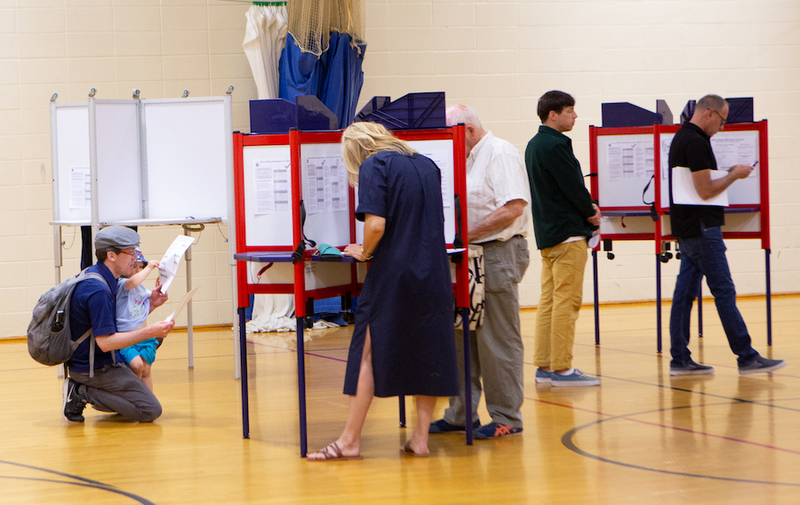 Throughout the day, various events and GOTV efforts are happening with residents and volunteers all across the state, including Maine’s inaugural PollFest: a multi-city, non-partisan, and exciting effort to increase voter turnout. Along with live music of every genre, #PollFest will bring voters unbiased information about voting and the ballot, food trucks, and volunteer-run transportation services for voters for easy access to the polls. Bluegrass in the west end, and hip hop at hadlock field. 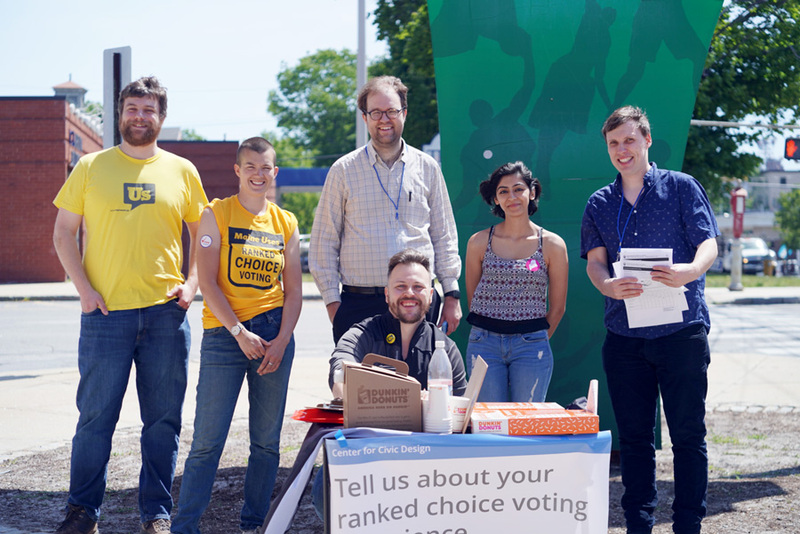 These volunteers from Maine Uses RCV, Represent.Us, and Center for Civic Design are out here talking with people about their experiences using ranked choice voting for the first time! Almost all the feedback about the process was positive. 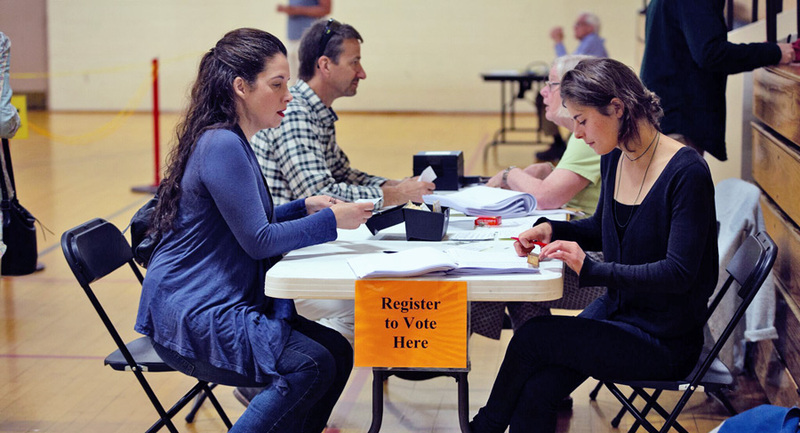 Did you know that Maine has same day voter registration? There are no excuses! Exercise your fundamental rights! 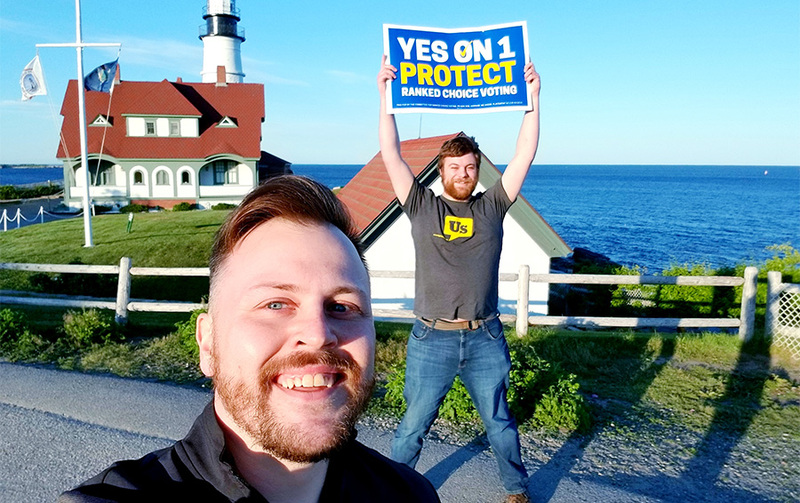 Polls are open and volunteers are on the ground to speak with Mainers about voting Yes on Question 1 to protect Ranked Choice Voting. Shout-out to our Collaborative Partners! Countless in-state organizations, individuals, news outlets, local publications, elected officials, and candidates support this common sense voting reform. We encourage you to connect with them on social media throughout the day, and learn more about voting Yes on 1 today!